Going to the golf course without a good rangefinder is similar like sailing a boat without a compass. In both cases, you will lose focus. Sometime a perfect compass may wobble a little bit. 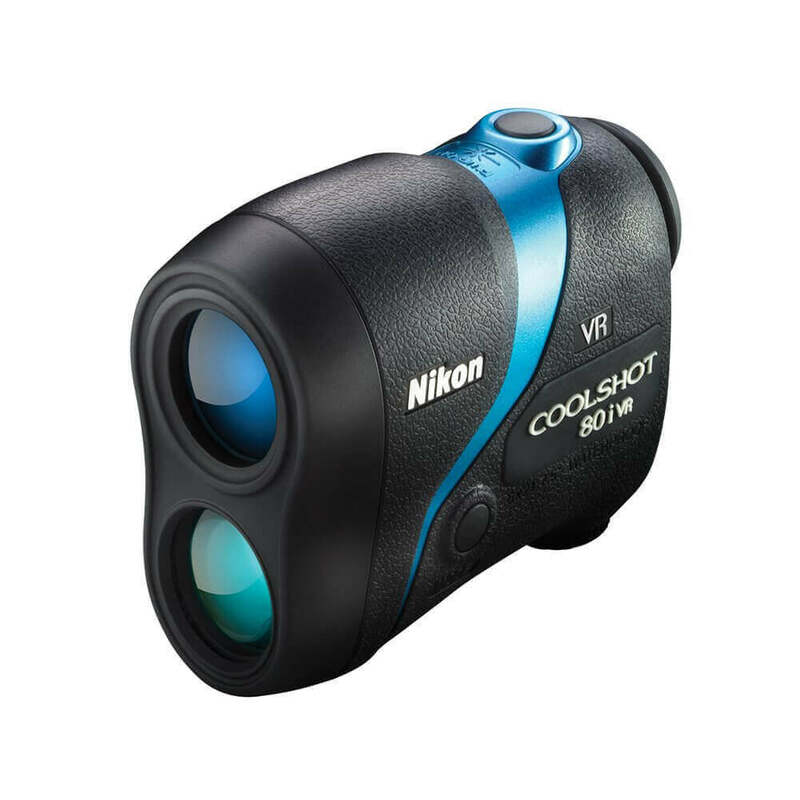 But Nikon Coolshot 80i VR Golf Slope Laser Rangefinder will not wobble during your game. Its Optical Vibration Reduction technology will keep your focuses steady. 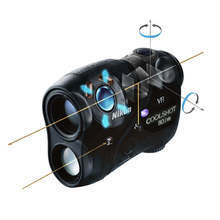 Nikon Coolshot is world's first Optical Vibration Reduction Golf Laser Rangefinder. It will ensure perfect shots each time you complete a par. This super compact golf rangefinder is a necessary item in any golf bag. You will get some extraordinary features at an affordable price. What extraordinary features will you get in Nikon coolshot 80i VR? Golfing tournaments exerts lots of pressure on the golfers. A little lap in focus can ruin your perfect "birdie." Moreover, wind, cold, and unbalanced positions can unstable your hands during a game. But these will not be a problem with Nikon Coolshot 80i. The Optical Vibration Reduction technology keeps your rangefinder steady in every movement. You will get a wide range of measurement with this rangefinder. It measures from 8 to 1000-yards with 0.5-yard increment. Each distance measure comes to you within half seconds. Hyper Read Ranging technology helps these quick measurements. Nikon Golf Coolshot is accurate to detect any objects in the field. It gives ±0.75-yard accuracy up to 700-yards. The precision of the rangefinder changes to ±1.25-yards beyond 700-yards. It is essential to know every detail of the golf course during the game. A golfer will get a continuous view for 8-seconds. This helps to measure multiple objects in the field of view. It can detect hazards, pins, mounds, and trees in the field. The rangefinder is equipped with multilayer lens. The 6x monocular bright optics helps to get your target quicker. The long eye-relief is an excellent aid to aim your targets. The First Target priority selects the closest target in the view. So if the flagstick is in front of trees, this mode will aim at the flagstick first. Nikon Golf Coolshot comes with Locked On technology. This feature boosts confidence in the golfers when they aim for anything. The locked on symbol appear when a target when you point at it. You can get slope-adjusted distance with Nikon Golf Coolshot 80i. This device use ID (Incline/Decline) technology to compensate uphill and downhill slope. What is Optical Vibration Reduction technology? The optical vibration technology is a unique feature in this viewfinder. It helps to reduce image vibration in the viewer up to 80%. Your hand can move for many reasons in a golf course. Cold, rain, or unbalanced movements, anything can move your hands. A slight hand movement will significantly affect the rangefinder measurements. This technology simultaneously aligns the image with the laser beam during any movement. The laser beam continuously focuses on the target and ensures a fixed image alignment. What is the maximum range of Nikon Golf Coolshot 80i VR? The maximum range of this rangefinder is 1000-yards. The closest distance you can measure is 8-yards. But if you prefer a low range in a similar price, you can consider Nikon Coolshot 40i. Nikon Coolshot 40i has a lower range. The maximum range is 650-yards. The 40i does not have Vibration Reduction technology in it. So it will not give you a precise measurement if the rangefinder moves. Moreover, 40i is lighter in weight than the 80i VR. Eye relief in Nikon 40i is slightly longer than the 80i VR. So the eyeglass wearers will have a comfortable view with 40i. The 80i VR model has a bigger dimension. But ergonomic design makes both the models very easy to grip. These two models have no other differences. They come with almost the same accuracy, magnification, and dimension. Both the models have ID technology to calculate slope-adjusted distance. Moreover, you will get the same field of view and target priority modes from this two models. Despite some difference in specifications, both Nikon Coolshot 80i VR and Coolshot 40i will cost you the same bucks. How accurate is Nikon Coolshot 80i VR? This device will give you ± 1.75-yards accuracy for up to 1000-yards. The efficiency is better in closer range. You will see ±0.75-yard accuracy up to 700-yards. Tec Tec Tec ULT-X has better accuracy than the Nikon models. It comes with ± 1-yard for 1000-yards. What is the 8-second continuous measurement? This is a scanning measurement process in Nikon 80i VR. This rangefinder can continuously scan up to 8 seconds. You will get individual measurements of all the subjects within that field of view. What kinds of target mode Nikon Coolshot 80i have? This rangefinder can use both first target and distant target priority mode. First target priority mode aim on the closest subject. This mode works best when the subject is in front of a background. The distant target priority mode measures anything in the background. This mode works best to detect any hazard during your par. Does Nikon 80i VR have any pin locking mechanism? Yes, this rangefinder has its signature pin locking mechanism called Lock On. A green circle appears on the viewfinder when you lock a target. Some models like Tec Tec Tec ULT-X vibrate when a target was locked on. What is angel compensation in Nikon Coolshot 80i VR? This is a slope-adjusted measurement system in this rangefinder. These measurements consider uphill and downhill slopes of a course. The rangefinder calculates these vertical variations to give an exact angel-compensated horizontal distance. You will find the same feature in Wosports Golf. But this feature is not available in GolfBuddy LR5 rangefinder. How do you compare between Nikon Coolshot 80i VR vs 40i? Nikon Coolshot 40i has a lower range. The maximum range is 650-yards. The 40i does not have ​Vibration Reduction technology in it. So it will not give you a precise measurement if the rangefinder moves. Moreover, 40i is lighter in weight than the 80i VR. Eye relief in Nikon 40i is slightly longer than the 80i VR. So the eyeglass wearers will have a comfortable view with 40i. The 80i VR model has a bigger dimension. The but ergonomic design makes both the models very easy to grip. These two models have no other differences. They come with almost the same accuracy, magnification, and dimension. Both the models have ID technology to calculate slope-adjusted distance. Moreover, you will get the same field of view and target priority modes from these two models. Despite some difference in specifications, both Nikon Coolshot 80i VR and Coolshot40i will cost you the same bucks. Why is Nikon golf Coolshot 80i VR special for you? This feature-packed rangefinder is a "must have" device for any golfer. You will get all the latest technologies at an affordable price. Optical vibration reduction makes it a unique model in the rangefinder market. Lock on circle gives extra confidence to any novice golfer. Moreover, the slop-adjusted measurement will help you to pick the appropriate golf club. High-quality optics helps to aim the flag of your next hole. You do not worry at all about any weather with this rainproof and moisture resistant device. Do you want to hit your winning shot today? Then put a Nikon Golf Coolshot 80i VR in your golf bag.